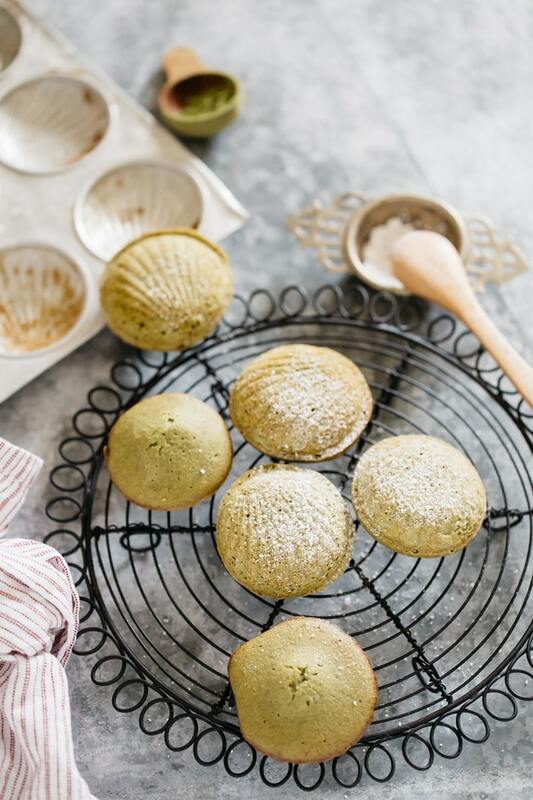 I love the aroma of freshly baked matcha madeleines, and how it fills my urban cottage home at this festive time of year. 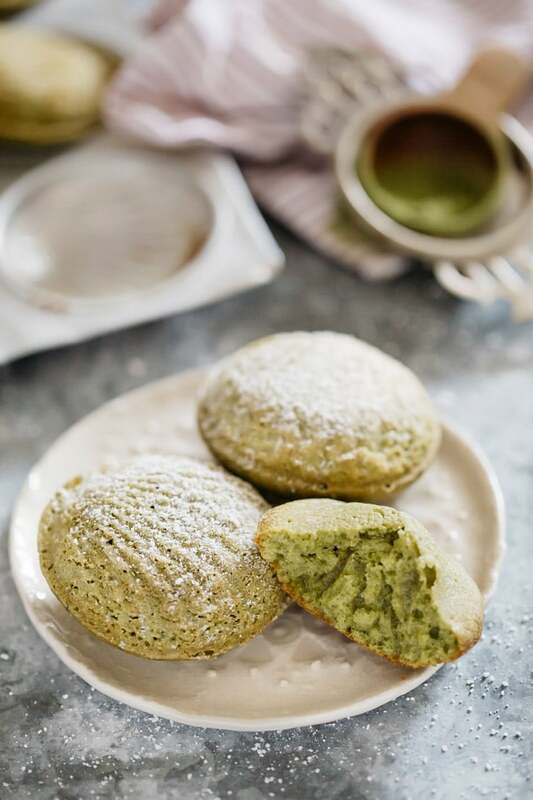 Baking with subtle matcha green tea and the hint of rich bittersweet flavour of matcha madeleines, is the baking I do for holiday season. It is just perfect. 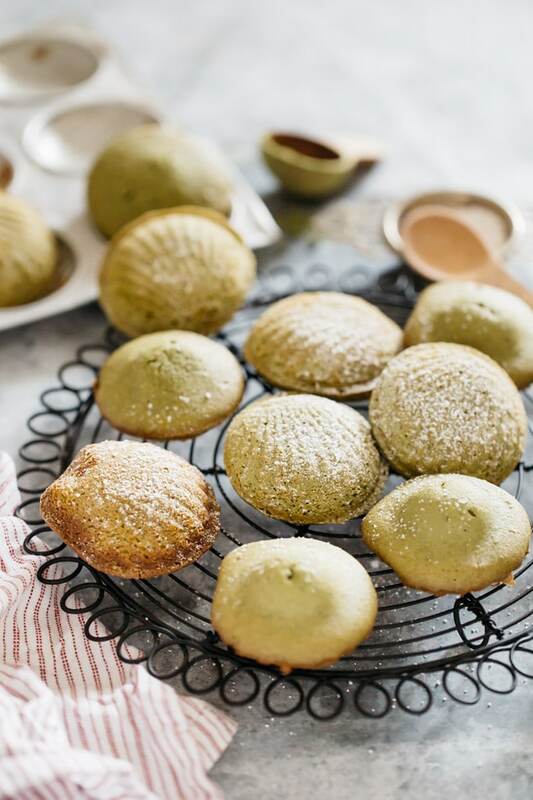 Here is my Matcha Madeleines recipe. Madeleines are a classic French petite butter cake. They are typically baked in a shell shaped mould. This is my favourite western sweet. It is also very easy to make and almost foolproof. 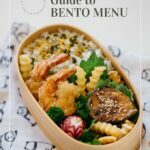 So how do I make it Japanese? 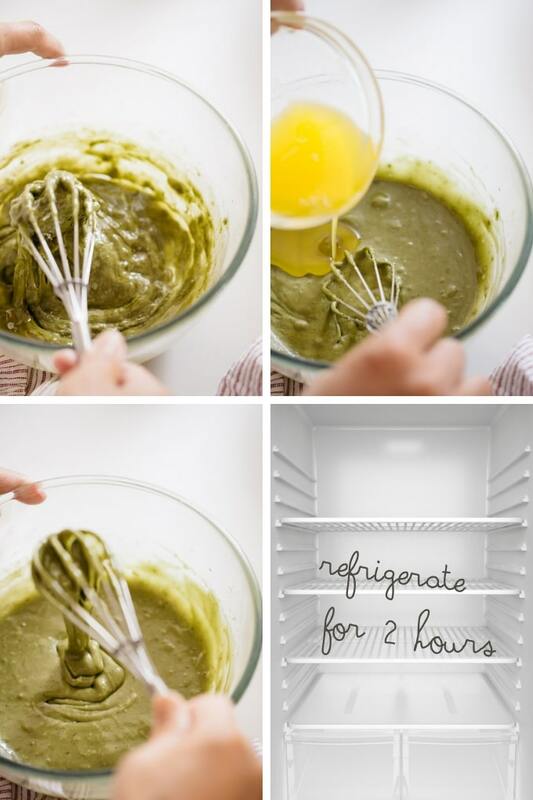 By adding Matcha flavour! Surprisingly (to me), because of it’s petite size, many people regard madeleines as cookies. It is however, a mini French butter cake and usually shell shaped. 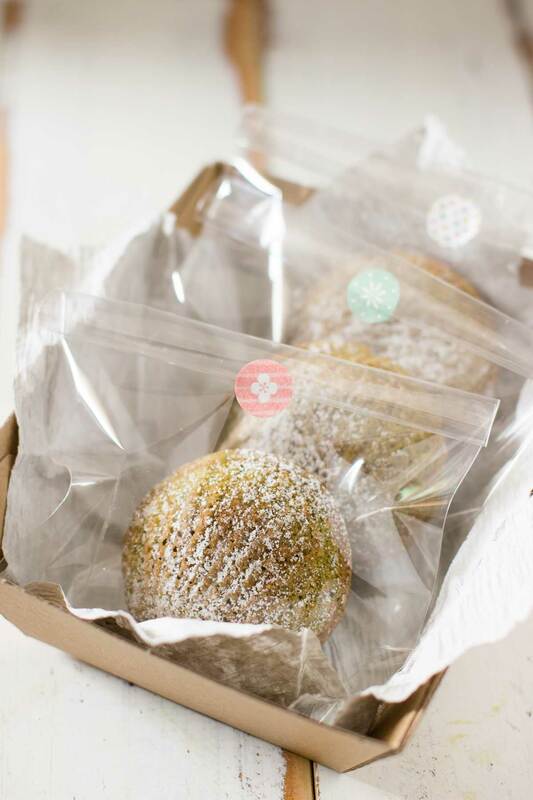 Madeleines and Baumkuchen (German Tree Cake) are probably the two most famous foreign sweets that Japanese people eat. Madeleines are my all time favourite French sweets. When I was a child, madeleines were a very special treat to eat. I only ever got to eat madeleines, when my uncle and aunty came to visit us, and brought some home-baked madeleines. 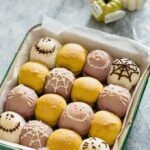 I was amazed by how delicious the little cakes were, and how they tasted like they were from a fancy french store, but were just made at home. I was so inspired by my aunt’s delicious madeleines, that I really wanted to start baking so I joined the school baking club. I really wanted to learn how to make amazing western sweets that we don’t commonly eat in Japan. Usually we eat things like mochi or red bean based desserts, so madeleines were always so special for me. I searched for the best madeleines recipe. It is a pretty shell shape isn’t it? Almost too pretty to eat. I was lucky to find a photogenic old round shell shaped mould from a local antique shop. Also I bought another one online because this is the cake I often make. Don’t worry if you don’t have one, you can use any shaped mould. 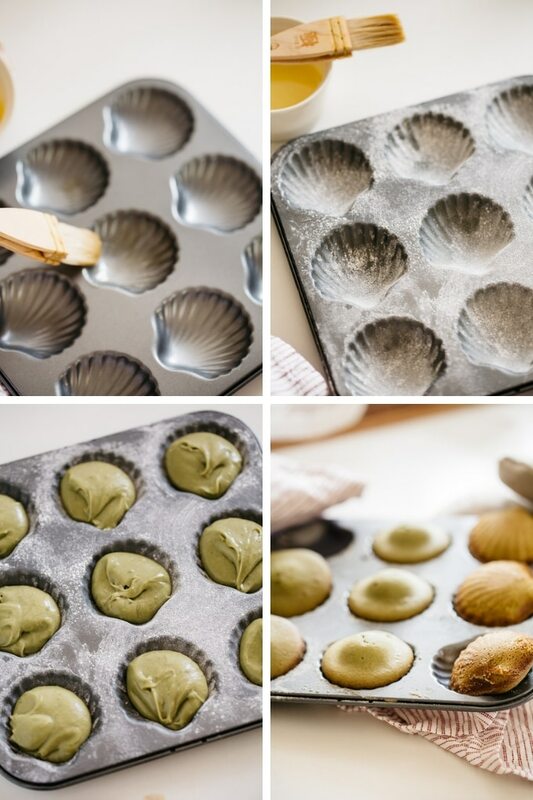 Japanese people often bake madeleines in shallow tart moulds. 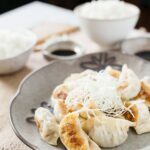 This is a really easy recipe to do because you just add all the ingredients to a bowl, and stir together. It doesn’t require any special beating or other things. You can change the flavour by adding some cocoa powder to make a chocolate flavour or you can add Hojicha to make Hojicha flavoured madeleines. Following this madeleines recipe, I always have the BUMP. Your success in baking Madeleines can be measured by the size of the bump! Chilled madeleines batter baked in a hot oven create that bump. 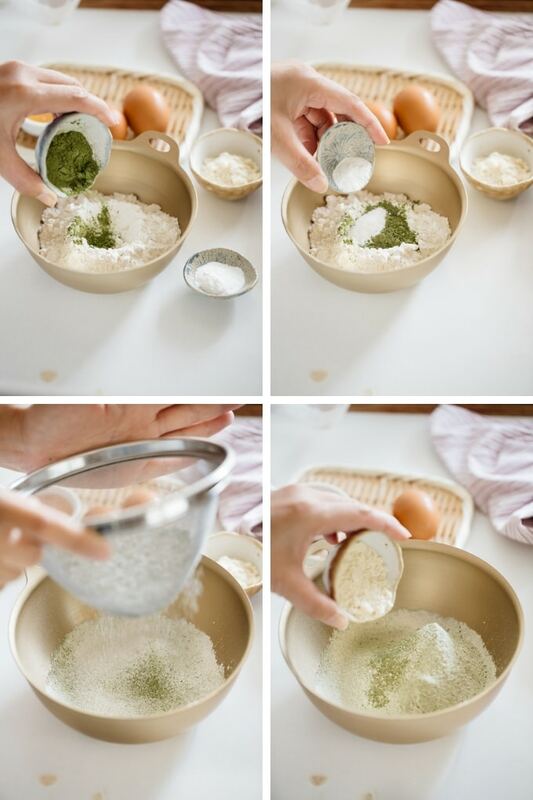 Sift the plain flour, matcha powder, and baking powder, all together and add almond meal. 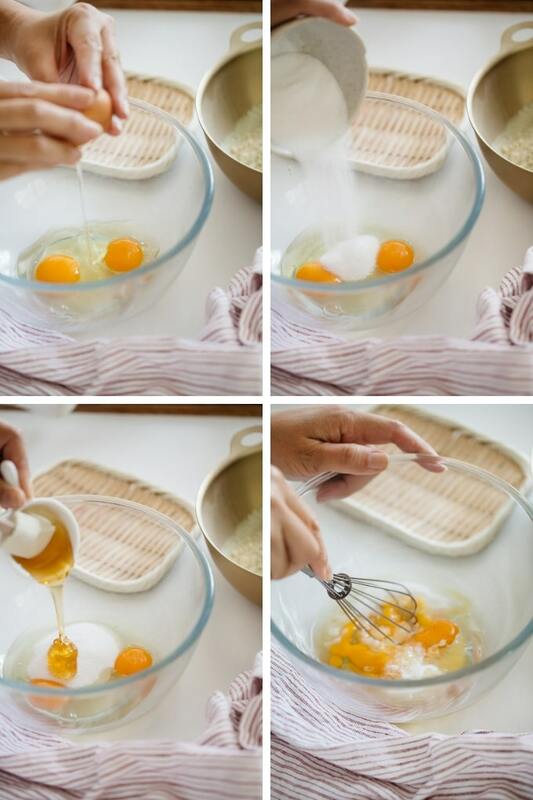 Mix the eggs, honey, and sugar all together without airinating the mixture in a separate bowl. 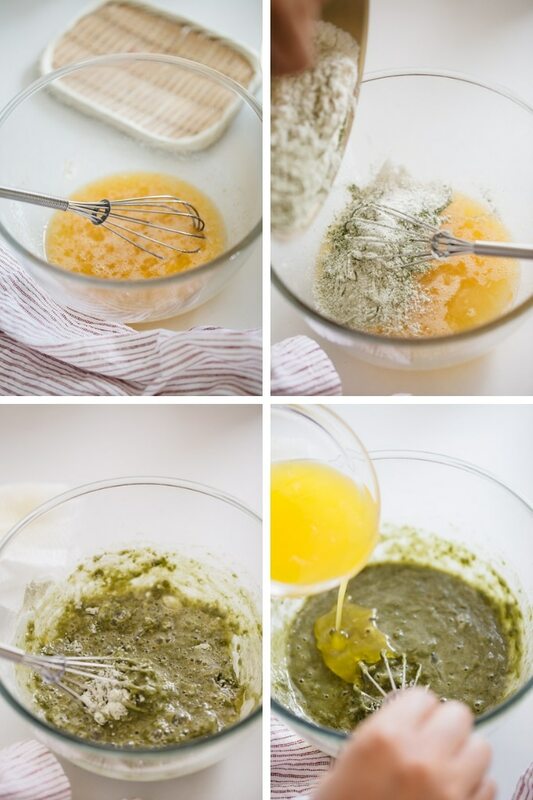 Add the sifted flour to the egg mixture and stir to combine. Add 1/3 of melted butter at a time and mix all together. Grease the madeleine tin with melted butter and then flour the tin. Preheat the oven to 180 degree celsius and bake it for 15 minutes. Remove from the tin and sift some confectioners sugar on top to serve. *1 a large egg weighed about 50 g was used. I love little french madeleines, they are so delicate and light. 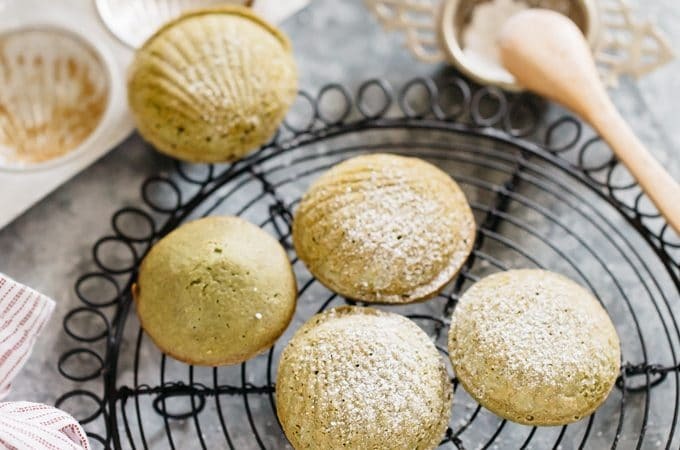 Never had them with matcha, but I am thinking it would be a great recipe to try for afternoon tea. Thank you so much for the comment and five star rating Claire 😀 This is always my go to afternoon tea. I have always love Madeleines and these are one of the most beautiful ones I’ve seen. Can’t wait to try these! Love these 🙂 So perfect and festive too! Wow very creative and yummy! Lovely madeleines . Thank you for sharing. Just want to clarify the almond meal used . is the 2 tbsp equals 10g or 1 tbsp equals 10g?